Motivational speaker Andrea Mosby started her speech on Saturday Feb. 4, with a story about being a troubled single mother at the age of 16, and how stress influenced her to lash out at her baby in a fit of depression by dropping him back into his crib because he wouldn't stop crying. 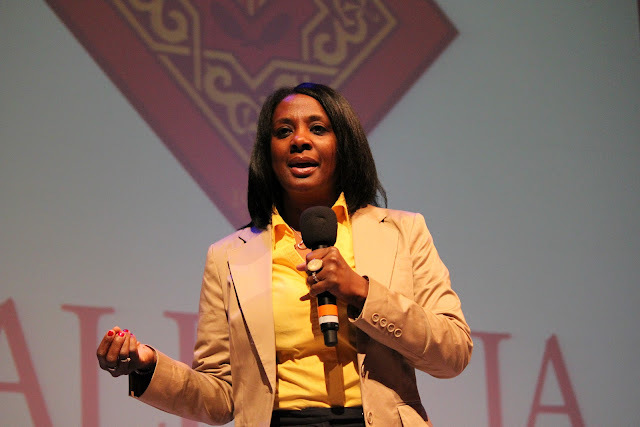 Mosby was sharing her personal stories to inspire students to find success in college and life. This was all part of the largest student success program at Valencia that provides financial help and assistance to those who qualify. The crib incident became a pinnacle moment in Mosby’s life, when she decided to start fixing the personal issues she was facing and become the best mother and person she could be. She went on to find success with a bachelor's degree in Business Administration and a master's degree in Urban and Regional Planning. Her son went on to be greatly successful and is now working for a Fortune 500 company. She breaks down her ideas on the personal improvement around the word “DECISIONS.” Each letter in the acronym is a positive characteristic to have: Determination, Energy, Courage, Intuition, Serious, Imagination, Open, Never give up and Success. This was a fitting introduction for the true focus of the event; the kick off to a special financial aid program, “Road-map to Success.” After the speech, students were given a detailed synopsis of what this program offers and how completing it will help them graduate. “A lot of students do make use of it, but we would like to see more,” said Kathleen Marquis, academic adviser at the west campus. Those enrolled in S.L.S. student success classes are eligible to earn points for academic advising, tutoring, being part of a club or organization, going to different skill shops and workshops and volunteering. Set points are earned for participation, and if 500 are earned a week before finals, students could receive a $500 award. It’s on a first come first serve basis, but the program has never run out of funds since its inception. “I really need this scholarship so I can afford to go to school; it’s the only way I'll be able to graduate,” said Shaun Clevenger, a first semester Valencia student hoping to major in criminal justice technology at UCF. 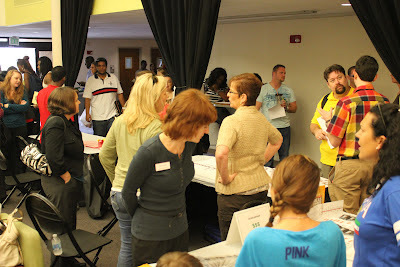 After being informed about the road-map program, the event ended with a resource fair informing students about different organizations and opportunities offered at Valencia, including academic centers with details on tutoring, different math centers, the library, and representatives from student groups like SGA and Valencia volunteers. The student success convocation was a unique opportunity to inspire, inform, and assist students in finding success in college and life. Many believe programs like this help Valencia College stand out and undoubtedly earn its recent recognition as the top community college in the nation. 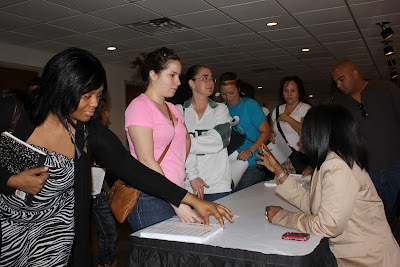 Andrea Mosby talks with students after her motivational speech. A resource fair is only part of this convocation for student success.